It is my opinion that a statistic capable of predicting itself---and perhaps more importantly predicting future success---is a superior statistic to one that only correlates to "simultaneous success." For example, a team's actual goal differential correlates strongly to its current position in the table, but does not predict the team's future goal differential or future points earned nearly as well. I created the expected goals metrics to be predictive at the team level, so without further ado, let's see how the 2.0 version did in 2013. Whether you're interested in offense, defense, or differential, Expected Goals 2.0 outperformed actual goals in its ability to predict the future (the future in terms of goal scoring, that is). That 0.800 R-squared figure for xGD 2.0 even beats xGD 1.0, calculated at 0.624 by one Steve Fenn. One interesting note is that by segregating expected goals into even gamestates and non-even gamestates, very little predictive ability was gained (R-squared = 0.805). Most of those statistics above showed some predictive ability in 17 games, but what about in fewer games? How early do these goal scoring statistics become stable predictors of future goal scoring? I reduced the games played for my predictor variables down to four games---the point of season we are currently at for most teams---and here are those results. Some information early on is just noise, but we see statistically significant correlations from expected goals on defense (xGA) and in differential (xGD) after only four games! Again, we don't see much improvement, if any at all, in separating out xGD for even and non-even gamestates. If we were to look at points in the tables as a response variable, or perhaps include information on minutes spent in each gamestate, we might see something different there, but that's for another week! Check out the updated 2014 Expected Goals 2.0 tables, which now just might be meaningful in predicting team success for the rest of the season. *A "home-games-played" variable was used as a control variable to account for those teams who's early schedule are weighted toward one extreme. R-squared values and p-values were derived from a sequential sum of squares, thus reducing the effects of home games played on the p-value. **Though the R-squared value was higher, splitting up xGD into even and non-even game states seemed to muddle the p-values. The regression was unsure as to where to apportion credit for the explanation, essentially. 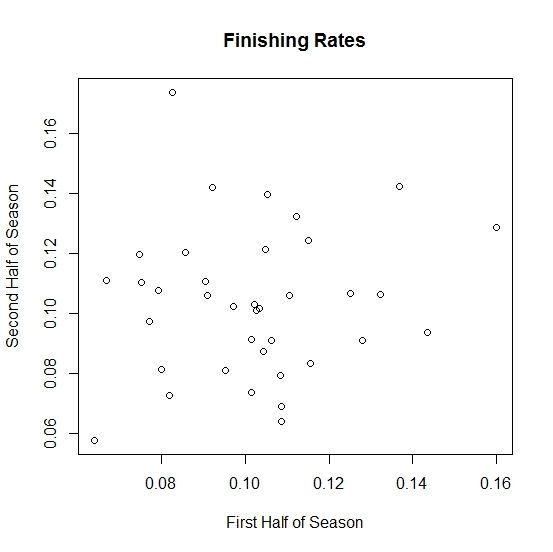 As a supplement to the stabilization analysis I did last week, I wanted to add the self-predictive powers of finishing rates—basically soccer’s shooting percentage. Team finishing rates can be found both on our MLS Tables and in our Shot Locations analysis, so it would be nice to know if we can trust them. Last week I split the 2012 and 2013 seasons in half and assessed the simple linear relationships for various statistics between the two halves of each season across all 19 teams. Now I have 2011 data, and we can have even more fun. I included bivariate data from both 2011 and 2012 together, leaving out 2013 since it is not over yet. It is important to note that I am not looking across seasons, only within seasons. To the results! Some teams finish really well early in the season, then flop. Others finish poorly, then turn it on. But there’s no obvious to pattern that would allow us to predict second-half finishing rates. In fact, the best prediction for any given team would be to suggest that they will regress to league average, which is exactly what our Luck Table does. It regresses all teams’ finishing rates in each zone back to league averages, then calculates an expected goal differential. On a side note, you might be asking yourself why I don't just use points to predict points. Because this: while the correlation between first-half and second-half points is about 0.438, the correlation between first-half attempts ratios and second-half points is slightly stronger at 0.480. Also, in a multiple regression model where I let both first-half attempts ratio and first-half points duke it out, first-half attempts ratio edges out points for winner of the predictor trophy. A good prediction model (on which we are working) will include more than just a team's attempts ratio, but for now, it is king of the team statistics.